Enter “Bill” from vendor (supplier) to be paid later. This is to record transactions as Accounts Payable (A/P) in QuickBooks. These are for purchased items or supplies, they are to be paid at a later date. Normally, your supplier will give terms at the time of purchase and it will show as terms and payment due date on their invoice. Click create + sign menu (top middle), it will spin and change to x sign. In QuickBooks, Bill feature is available in Essentials plan and Plus plan. This feature in not available in Simple Start (or Easy Start) plan. Choose a Vendor Choose the vendor who sent you this bill. If this is a new vendor, you can choose "+ Add New" (top of the list) from here. Click Save. Only the Vendor’s name gets saved. You can go to the Vendor page (left navigation bar > vendors > choose vendor) later to enter additional information. Optional: You can also choose available "Autocomplete widget" from the QuickBooks Labs. From home page screen > company gear (upper right corner) > settings > QuickBooks Labs > Autocomplete widget > Switch ON. Once it is activated, go back to vendor form (refresh the page if needed). Add NEW vendors more easily so you can create bills faster. You just type vendor name (for example: Office Depot), QBO will fill in the rest. They use publicly available white pages info to complete the address, phone, website, tax ID, and more. To learn more and see demo, click here! This is for both vendors and customers. Enter the Terms Enter the Terms of this bill. This is how long the vendor gives you to pay. For example, Net 30 means you’ve got 30 days from the bill date to pay it from their Invoice date. Normally, it should indicate TERMS on their Invoice. You can also make "Default bill payment terms" say for example terms 15 days by changing the setting. Enter the Bill date This date is as shown on the Vendor's Bill. This is not your selected entered date. Due date QuickBooks will automatically compute this due date based on entered terms and bill date. You just to verify vendors payment due date with actual bill. Also, allow couple of days in advance to pay the bill. Vendors expect payment on time, the same way you like to see receiving payment from our customer on time. Enter the Vendor Bill Number This is invoice number from the Vendor Bill. Accuracy of this reference number is very important, especially if you are making payment for multiple bills in one check. Description Enter description based on vendor bill. For example, purchase of printing paper or office rent for August. Very useful information when running the report for past transactions. Account Category In Account (start with #1), choose the category for the purchase or service you’re paying for in the drop down menu as listed on the Chart of Accounts. For example, for the purchase of supplies from the Office Depot choose an account such as Office Supplies. Add the Amount for this bill. Split Account If you have a Bill that you would like to split to more account categories, choose line #2 (for more click "Add line"). It will expand to six lines. Memo Use memo field, to enter more information related to this bill. This memo is mainly internal. It doesn't appear on printed bill payments. Attachments To attach, vendor bill or receipts against this voucher, choose paper clip icon from your computer. Once it is downloaded, it will show file name. Save Click "Save" if you have a long Bill to enter. This way it will not lose in case of internet disruption. Save and new or Save and Close Click "Save and new" to enter a new Bill. Click "Save and close" if you are done here. For bills that you need to pay monthly (or on any other regular schedule), set up a new recurring template to be reminded to enter the bill. 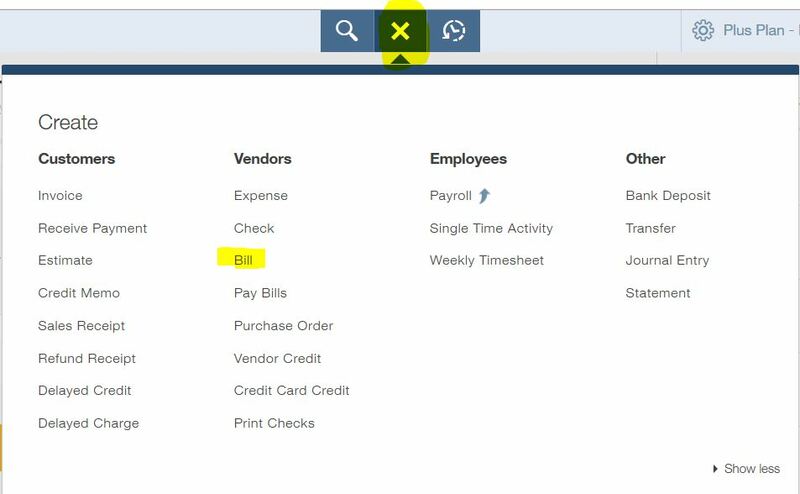 Make payment from the Vendors (from the home page screen > left navigation bar > vendors > choose vendor > under action column, select make payment. Expense Transactions pages (from the home page screen > left navigation bar > transactions > choose payee > under action column, select make payment. To pay more than one bill, click Create (+) > vendors > Pay Bills > select bills to paid for payees. These are expanded Bill (vendor forms) features available in Plus plan. Item details section is for entering purchases of inventory items bill in QBO Plus plan. Once you enable those two features in settings, you will be able to set up track-able inventory items in products/services list and then able to enter inventory items Bill with quantity and rate columns. Location applies to a single location per Vendor Bill field. You cannot select multiple locations. For tracking classes, it is added to column field. You can select multiple classes. Locations and classes tracking fields are for both account details and items sections. Once they are enabled, it applies to both account details and items sections.